Human Trafficking – The Real-Life Dilemma | John Reinhard Dizon's "Transplant"!!! The darkest subplot in John Reinhard Dizon’s Transplant focuses on Adam Rauch’s diabolical deal with drug lord Django Tamsulosin. Django agrees to supply ‘volunteers’ for Rauch’s experiments with the understanding that they are never to return to the streets of Harlem. At first the victims are brought to the lab on the brink of death, and Adam harvests their organs before they expire. Eventually they are brought while unconscious, and Adam realizes that Django expects them to be euthanized. He begins to keep the survivors in a state of heavy sedation, rationalizing that captivity is a more humane fate than death itself. Human trafficking in the 21st century has reached epidemic proportions. There are more people being held against their will and used as chattel than during the peak of the Slavery Era of past centuries. The United Nations webpage at http://www.unodc.org/unodc/en/human-trafficking/what-is-human-trafficking.html documents the ongoing struggle against human exploitation. Though the plight of the victims in Transplant may be a fictional representation of such scenarios, it is imperative that reading audiences everywhere become aware of such injustices. From drug addicts to supermodels to NBA superstars, this novel reminds us that when the weakest among us are endangered, ultimately we must all join together to eliminate the threat to one and all. 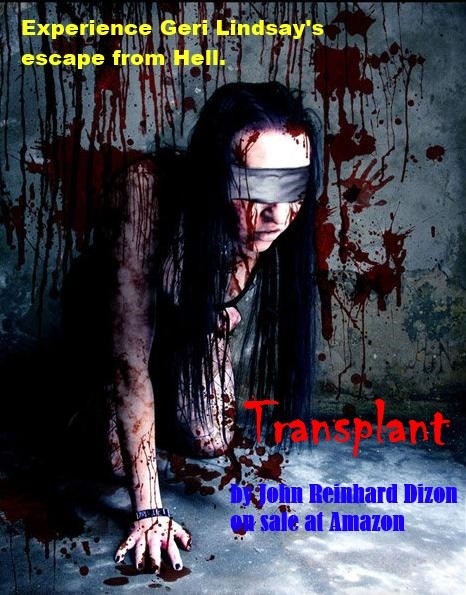 This entry was posted in Horror, Suspense/Thriller and tagged human trafficking, John Reinhard Dizon, Transplant novel. Bookmark the permalink.